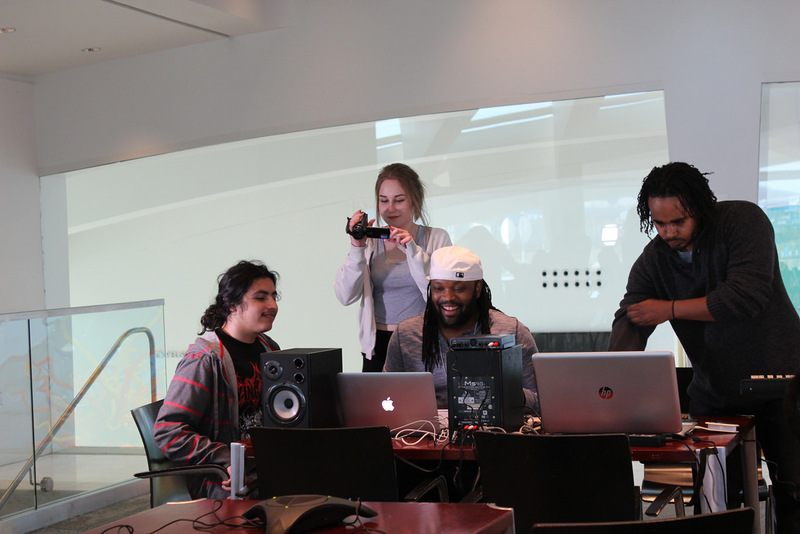 Four years ago, in 2011, I was introduced to Dwight and Marquis Gilbert — otherwise known as H2O Milwaukee Music — and the teen programs at the Milwaukee Art Museum were forever changed. Okay, that might be a little dramatic, but collaborating with Dwight and Marquis has without a doubt been one of the highlights of my teaching work here at the Museum. Dwight and Marquis are cousins and Milwaukee natives with a deep passion for music. 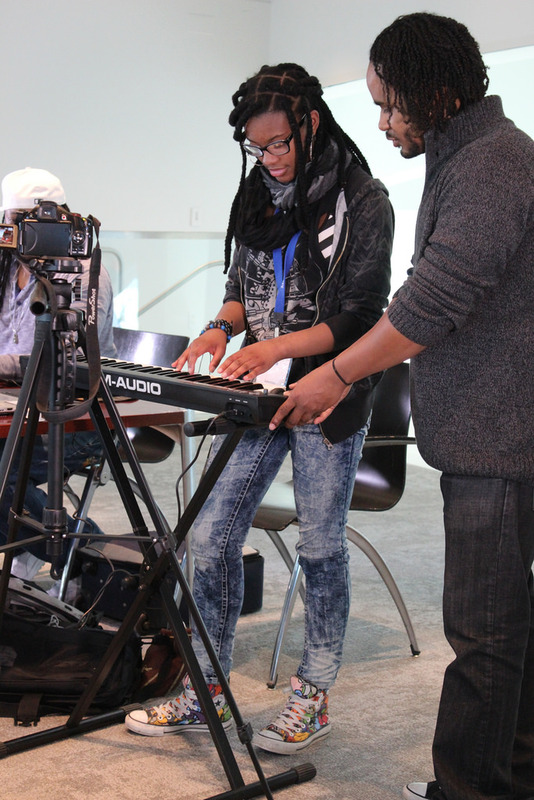 Their organization, H2O Milwaukee Music, creates after-school programs that teach youth music theory, technology, and life skills in a super engaging way: by empowering them to create their own tracks (and even music videos). Back in 2011, I was experimenting with mashing up other disciplines with art, and when I heard about what Dwight and Marquis do, I was so excited to bring them in to experiment with our teen programs. 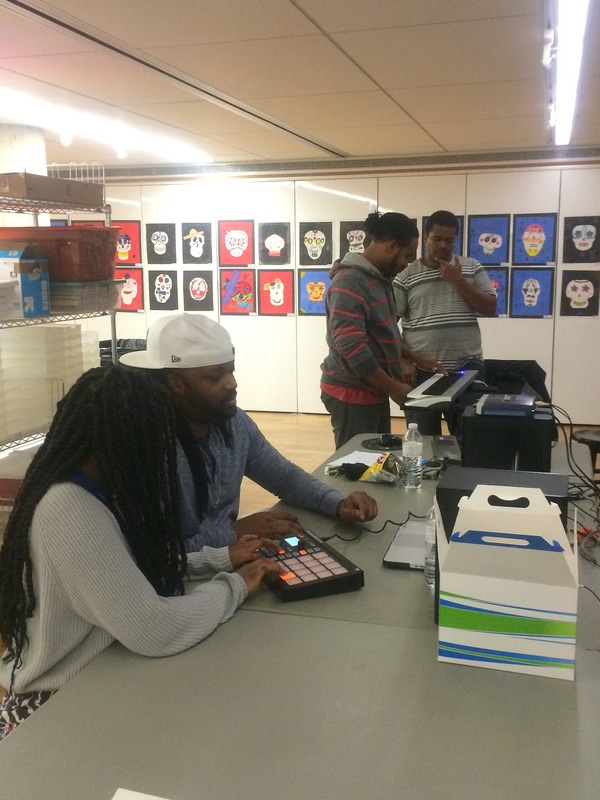 They gamely took up my challenge–to help our students create a track inspired by a work of art in one session at the Museum–and worked with our Satellite teen interns to create music inspired by Jim Campbell’s Taxi Ride to Sarah’s Studio. This year, H2O returned to collaborate with us again–multiple times! In this post, I’ll highlight some of the work they’ve done with us this year and share some of my takeaways from working with them. First, H2O joined us to explore Italian Baroque paintings in Of Heaven and Earth in the fall in the Satellite teen program. They took up the challenge of helping the teens interpret two Salvator Rosa landscape paintings through music–no small feat! What you’ve probably noticed by now is not only how fun Dwight and Marquis make this process, but how they allow for many modes of interaction. Not everyone is comfortable playing melodies or beats in front of the room (myself included! ), so they have cameras available for shyer students to take photos, video, and document the experience. They also begin by asking the whole group for general feelings and sounds they associate with the work, and periodically address the whole room throughout the session to keep everyone involved. Finally, this winter, the Museum launched its first-ever MOOC (massive open online course), Hangout with Art. In the course, we invited local Milwaukeeans who use art in their work but don’t work at a museum to speak about what they do. Naturally, for our art and music theme, we thought of Dwight and Marquis right away. Their talk is inspiring and touches on the history of their organization, highlights of some of their work, and provides great food for thought for anyone interested in music, education, or the arts. I think part of the reason we here at the Museum get along so well with Dwight and Marquis is because we share very similar ideas about teaching. At the Museum, our teen programs are highly student-centered, so everything from discussions to final projects are driven by the interests of the students themselves. 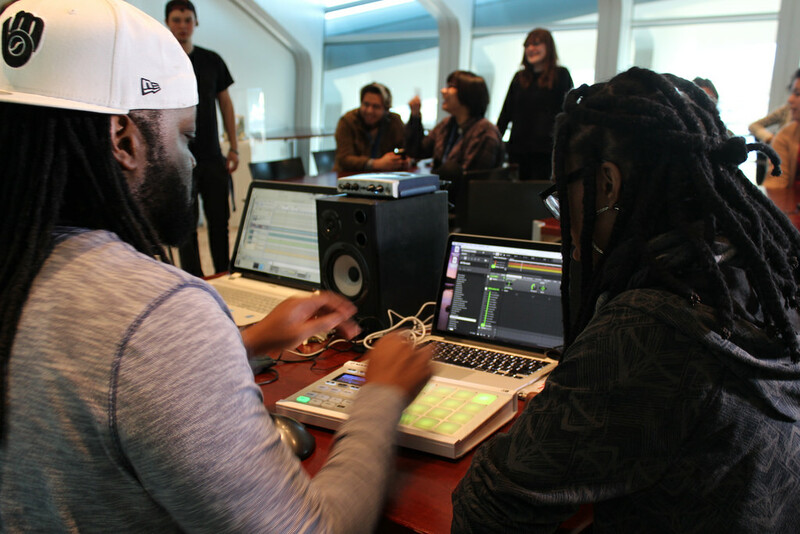 Dwight and Marquis do the same thing with music, whether it’s in a school, allowing students to choose the social justice-based message behind a track, or here at the Museum, where the teens decide the feel of the music and create the beats and melodies themselves. As you can tell, we’ve loved collaborating with H2O Music over the past four years. Here’s to many more fruitful and inspiring collaborations! This entry was posted in Behind the Scenes, Education and tagged Music, music and art, Satellite High School Program, Teen Programs. Bookmark the permalink.